Written by Tony F. Human, D.O. There are several alternative avenues of treatment that offer relief from many recurrent or lingering musculoskeletal issues other than mainstream medical treatments. The following is a list of alternative treatments that have specific benefits to individuals carrying above average amounts of muscle mass. The benefits of deep tissue massage include increased blood flow, stress relief, and reduced chronic pain. Deep-tissue massage can be an effective treatment for injured muscles because it facilitates the movement of toxins from the muscles, helps stretch tight or twisted muscle mass, and can help promote healing. Over time, deep-tissue massage therapy can help break up and eventually erase scar tissue in the body. It does this by improving lymphatic circulation and drainage, thereby improving flexibility and range of motion in the affected area. Scar tissue is often associated with ongoing pain and stiffness; deep-tissue massage can improve these symptoms. Deep tissue massage can also help with blood pressure issues and depression. According to a study cited by the University of Maryland Medical Center, people who have had a deep-tissue massage saw their systolic pressure drop by an average of 10.4 mm Hg and their diastolic pressure drop an average 5.3 mm Hg. Deep-tissue massage can also promote happiness and good feelings by increasing the body's production of serotonin. Several prominent professional bodybuilders use deep tissue massage regularly. We offer it in our office and I recommend it to all of our contest prep clients. It should be noted that deep tissue massage is not relaxing or for 'girly men'...it can be very painful and usually results in soreness. The basic principle of acupuncture is to realign and re-balance the energy in the body. While massage therapy relaxes muscles and tendons, acupuncture supports and reinforces the whole body to heal itself. Acupuncture is amazing because it triggers the release of your body's own natural painkillers, which are called endogenous endorphins. This is similar to the endorphin release you get after a good workout. Acupuncture can improve blood circulation and energy flow throughout the meridians in the body. Benefits of acupuncture include a reduction in pain and swelling, speeds healing, relieves muscle spasms, improving blood circulation, stimulating natural endorphins and anti-inflammatory hormones in the body. Acupuncture can also cleanse the body organs, which may hold unnecessary toxins, tension and stress. Qi (pronounced 'chee'), life-giving energy that flows to every cell, tissue, muscle, and organ in your body through 14 main meridian pathways, can become stagnated. Acupuncture can attract or repel this energy, re-establishing a balanced flow of energy throughout the whole body. I know for a fact that Phil Heath is a huge fan of acupuncture and he looks pretty good! 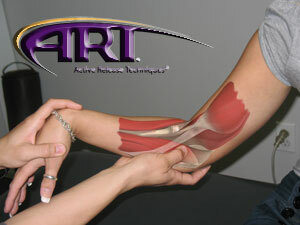 ART is a soft tissue system/movement based massage technique that treats problems with muscles, tendons, ligaments, fascia and nerves. Headaches, back pain, carpal tunnel syndrome, shin splints, shoulder pain, sciatica, plantar fasciitis, knee problems, and tennis elbow are just a few of the many conditions that can be resolved quickly and permanently with ART. These conditions all have one important thing in common: they are often a result of overused muscles. This can cause can cause your body to produce tough, dense scar tissue in the affected area. This scar tissue binds up and ties down tissues that need to move freely. As scar tissue builds up, muscles become shorter and weaker, tension on tendons causes tendonitis, and nerves can become trapped. This can cause reduced range of motion, loss of strength, and pain. If a nerve is trapped you may also feel tingling, numbness, and weakness. ART can rapidly free the adhesions, restrictions, and nerve entrapments. ART is also common among bodybuilders, power lifters, and NFL players. Spinal health will determine athletic success more than any other factor. Spinal health also determines exercise form and bodily function. The simultaneous contraction of large muscle groups requires nerve signal efficiency that is possible only if the mechanism of transmission and propagation - the central nervous system - is free of subluxations and impediment. You may be asking, "Tony, what the hell are you talking about and what the hell is a subluxation!?!?!" Basically, every move we make is initiated as an impulse from our spinal cord. Without a healthy spine and nervous system, adaptation to exercise cannot occur. Consequently, the body becomes susceptible to injury, illness and disease. Chiropractic enhances performance. There are not very many elite athletes today who do not use a chiropractor; examples that do: Tiger Woods, George St. Pierre, Chipper Jones, Terrell Owens, Jay Cutler, etc. When your body and spine are in alignment and the pressures are off the nerves which innervate each part of your body, you perform better. I have a chiropractor in my office, he's indispensable. The athletes that I treat and also see him, do better and progress faster than those who just see me. I have witnessed this phenomenon year in and year out. Believe it or not, Hall of Fame bodybuilder and former power-lifter, Franco Columbu is now a practicing Chiropractor. Graston Technique is an innovative, form of instrument-assisted soft tissue mobilization that enables clinicians to effectively break down scar tissue and fascial restrictions. The technique utilizes specially designed stainless steel instruments to specifically detect and effectively treat areas exhibiting soft tissue fibrosis or chronic inflammation. ñ increase histamine response secondary to mast cell activity. One would think that with such a vast array of benefits that Graston providers would be easy to find. However, the opposite is true. Graston providers are notoriously difficult to find, but can be invaluable in treating chronic pain from old injuries. Physical therapy can make huge differences when it comes to injuries, and imbalances. There are two phases of physical therapy, passive therapy and active therapy. Passive therapies are therapies that are done to you. Examples include ultrasound, hot and cold laser, infrared, electric stimulation, phonophoresis, iontophoresis, and traction. Active therapies are things that you yourself do, like range of motion exercises, stretching, and strengthening exercises. Immediately after an injury, rapid initiation of the passive therapies can significantly shorten the down time. The passive modalities are aimed at increasing local blood flow, reducing pain, and reducing inflammation. The active phase is designed to increase range of motion, as well as muscle endurance, muscle strength, and proprioception. Most of you may have used one or more of these alternative therapies before; but I would encourage anyone who suffers from restrictions, loss of motion, chronic or recurrent pain, and muscular imbalances to explore as many of these as necessary to get relief. My friend, and partner in our contest prep company, were doing an intense leg work out one day. He felt a pop in his hamstring. He limped a few steps and laid on the ground in agony. After a few minutes, we walked the 50 feet to my office. I did ultrasound, infrared therapy, and electric stimulation with ice. I then gently stretched it out. I called him later and he said it felt pretty good. The next day, it was better. Who knows how bad the injury would have been without immediate treatment. This is why professional teams will take a player back to the locker room after an acute injury and many times they return to play. Most people aren't healed in a day, especially from chronic or recurrent injuries with loss of motion, but the right therapies can significantly help our healing process. My multi-disciplinary practice, north of Atlanta consists of myself, a physical therapist, two physical therapy assistants, two massage therapists trained in deep tissue, and a sports chiropractor. I also encourage all of our contest prep and training clients to take advantage of one or more of these services, and they are always glad they did.